I’ve been thinking about cancer a lot more than I used to. Mojo was diagnosed with a small but clinically significant prostate cancer in September 2009. And that’s when I needed to know more about cancer. His diagnosis began with a routine blood test during his annual physical which indicated an elevated PSA (prostate specific antigen). He went in for a retest, biopsy, and finally on January 19, the day after his 53rd birthday and 4 days after our 10th wedding anniversary he had a radical prostatectomy. His pathology report contained comforting words, clinically delivered. And the best news of all came three months later on April 19th when Mojo’s first post-surgery blood test came back with a PSA of zero. He is cancer free! Two days after Mojo’s surgery, on January 21, my sister Wendy had a lumpectomy for non invasive stage 0 ductal carcinoma. Once again I needed to know more about this cancer which was hurting my sister. A few days after her surgery, she got the good news that the surgery removed the lesion with a wide margin of healthy tissue. A few weeks later Wendy was scanned, marked and stickered for twice-a-day radiation treatments over five days. Finally, in early March, Wendy was released from what she affectionately called BAM – the Borg Assimilation Machine, when the radiation hardware was removed. Also in early March, while cancer was so heavy on my mind, I traveled to the Lunar and Planetary Sciences Conference (LPSC) near Houston, Texas. I met an amazing woman who I previously only knew from the social media science community. Little did I know that the very week I met Susan face to face for the first time at LPSC, as we stared at each others name badges, and exclaimed “I know you from Twitter“, she was having a recurrence of inflammatory breast cancer and had to leave the conference for tests, surgery and next steps. I didn’t have a clue at the time about her three-year battle with this deadly form of cancer. And once again I needed to know more about cancer. I am happy that Mojo, Wendy, Susan and millions more are cancer survivors. I am so sorry that Susan is facing a recurrence of her cancer. I want to take action to find cures and answers about cancer! Not with my checkbook, but as a volunteer for research that will stop cancer from attacking my family and friends. So it will come as no surprise that my sister Wendy gave our mother a diamond cancer awareness pendant for her recent 80th birthday. Wendy replaced the chain with two ribbons, a pink one and a blue one. The pink ribbon represents breast cancer awareness and the blue ribbon represents prostate cancer awareness. At the birthday party, I shed a tear for the family and friends I have lost to cancer, and for those in my family who are struggling with this deadly disease right this minute. But I was gleeful too. Our family all raised their glasses, and each in his or her own way were thankful to have Mojo and Wendy at the birthday table as our mother turned 80 years old. Thanks Jane, for all the support and love you’ve given as I went through cancer treatments at the same time as Mojo! I feel great and don’t expect cancer to come my way ever again. But I’m proud to join the ranks of the millions of cancer survivors. Thanks Jane for sharing your reflections. Sobering, yes: but the ‘call to action’ you came to and outline is engaging and hopeful. I was moved. Jane, this is awesome! Your willingness to participate in research projects can help researchers find a cure, and pin down the causes too. By blogging about it, you’ve spread the word to your network too — and I know you have quite a network! It was such a pleasure to finally meet you in person at LPSC — I’m just sorry that cancer had anything to do with it! Although one might say my “contribution” to prostate cancer research was involuntary, there actually was a voluntary component to it. I was offered paperwork to contribute my prostate to a study, and naturally I was happy to do so. I can’t imagine why one wouldn’t, though that is an additional option created by opting for surgery rather than radiation. Thanks, Ray! I really enjoyed sharing these thoughts. As I hit the “publish” button” the tears came flowing – I suppose they were tears of hope, relief, joy and sorrow all mixed up. We’re proud that we raised our glasses to toast Mojo and Wendy on their successful cancer treatment. As a Kaiser volunteer for more than ten years, I’ve (Alan) been in and out of the oncology and chemotherapy centers dozens of times and have had many thoughtful conversations with patients. We’re very proud that our kids in different ways are also volunteering in the fight against cancer. 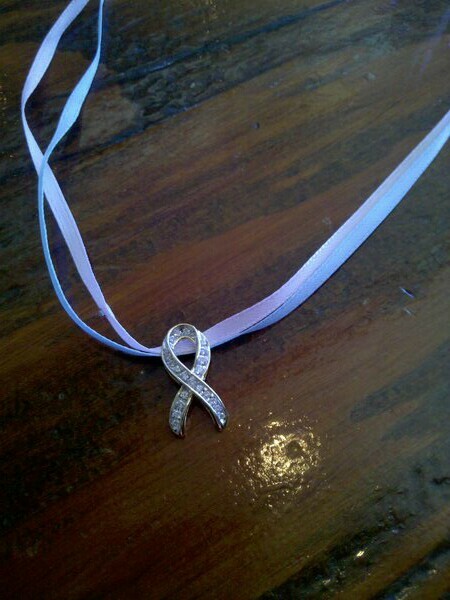 I (Barbara) have added a gold chain to the cancer awareness pendant and will be wearing it regularly. Hello Jane. I just came across your site. Actually it happened in the saddest of circumstances. I was looking for other people blogging about their experiences with overcoming cancer. I came across susan@whymommy’s site. Hard to explain the emotions of hearing someone has fallen. Not sure how to describe the emotions that well up. I did not know her, but feel somehow linked through cancer. Odd stuff. I have a blog http://www.cancercounsel.com.au that I’ve just recently launched. I have no great agenda other than to share my experiences and hopefully give some useful thoughts on the things that have helped me endure. I am not pushing any dogma or selling any snake oil. I have a low opinion of those who do. I’m just trying to give something back to others confronted with the same predicament. I see you are doing similar things with you blog. I like what I have read and just wnated to say hi and encourage you to keep up the good work.